Last week we released our offensive line rankings heading into the 2018 season, but as everyone knows, that’s not the only side of the trenches that matter. In today’s NFL, with an ever-increasing emphasis on the passing game, the ability to rush the passer continues to be incredibly important. Whether it be taking the quarterback down and sacking him to put the offense in a tougher position to continue drives or rushing quarterbacks into mistakes that prevent touchdowns and lead to turnovers, defenses are always looking to add talented pass-rushers. Heading into 2018, we’ve ranked all 32 teams by their ability to get after the quarterbacks. The Eagles led the way in our offensive line rankings and they lead the way again here. With a unit that is as impressive on the edge as on the interior, and with elite top level players and solid depth, another big season seems likely. Graham racked up 11 sacks, four hits and 45 hurries on his way to finishing the year as our eighth-highest graded edge defender. Meanwhile, Cox dominated on the interior with 51 total pressures. The big addition is the former Seattle Seahawks standout in Bennett, who arrives to Philadelphia after a 70 total pressure season in Seattle. The unit loses Vinny Curry, who added 47 pressures of his own in 2017, but look for Derek Barnett to see a bigger role after producing six sacks as a rookie. Oh boy is this a fun unit up front. 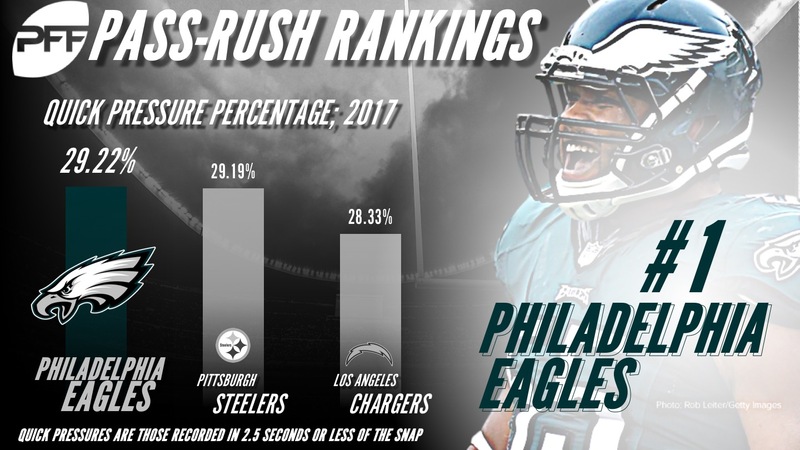 The Jaguars pass-rush was instrumental in their success in 2017 and there are no signs that they are likely to slow down any in 2018. Campbell racked up 73 total pressures in the regular season in his first season in Jacksonville, producing a PFF grade of 93.5, the highest of his career to date. Opposite him, Ngakoue continues to emerge with 70 total pressures, including 13 sacks. With the success of those two, Jackson has been slept on, despite adding 51 pressures himself in the regular season. Fowler Jr. hasn’t lived up to his pre-draft hype yet, but is coming off a season where he produced up 37 total pressures, with flashes of good play. Were we looking purely at pressure off the edge, the Chargers would certainly be number one. The combination of Bosa and Ingram at either defensive end position is deadly, and the Chargers saw 151 of their total pressures come from the duo. They were the only team in the NFL to feature two edge defenders who finished the 2017 season with an elite (90.0-plus) PFF grade, and there’s no reason to expect them to slow down much in 2018. The bonus in 2017 was Liuget producing the best year of his career, adding 26 total pressures from the defensive interior. The Rams are the only team in the NFL who can boast a player like Donald. At just 27 years old, he has already racked up 41 sacks, 67 hits and 199 hurries in his career. Shaking off any pre-draft concerns about his size, Donald has been dominant since arriving in the NFL out of Pittsburgh as his skillset is too much for opposing teams to handle. While there are question marks on the edge with Longacre and Ekubam currently set to start despite having combined for just 50 total pressures so far in their careers, the Rams made a big addition on the defensive line in Suh. He arrives on a one-year deal, and while he isn’t quite as dominant as Donald, has still racked up 57 sacks, 87 hits and 289 hurries over his eight-year career. The Texans are one of the more interesting pass-rushing groups to look at, mainly because much of their potential success depends on players returning from injury and hitting the ground running. Former No. 1 overall draft pick, Clowney started his career as a better run defender than pass-rusher, but came into his own more in terms of getting after the quarterback last year, racking up eight sacks, 14 hits and 42 hurries. While Aaron Donald rightly gets all the credit for his dominance right now, it’s important to not forget just how dominant Watt was before having two seasons wrecked by injury. The man who produced 85 sacks, 151 hits and 197 hurries between 2011 and 2015 is a perfect candidate for Comeback Player of the Year in 2018 if he can stay healthy. Elsewhere in Houston, Mercilus racked up 26 sacks, 24 hits and 90 hurries between 2015 and 2016, before missing most of the 2017 campaign, so if he and Watt can hit the ground running, this is a unit that can cause problems for opposing offenses. Of the team’s in our top six, this is the one that I expect will surprise people the most, and that’s because the Redskins pass-rush was quietly one of the best in the NFL last season. Kerrigan produced 18 sacks and added four hits and 42 hurries, but with the Redskins struggling in general, it felt like his big performance didn’t get the credit it deserved, despite making the Pro Bowl. Where the Redskins can really impress people this season though is on the defensive interior. Ioannidis quietly produced the 14th-highest graded pass-rush grade among interior defenders last season, while the rising second-year star in Allen was on course to also rank inside the top 20 before injuries ruined his first season in the NFL. Miller remains one of the premier edge defenders in the NFL, racking up 83 total pressures in the 2017 regular season. Our key signature stat for pass-rushers is pass-rushing productivity, and Miller has ranked in the top three among 3-4 outside linebackers in that regard in each of the past three seasons. Where the Broncos could do with a boost, is opposite Miller. Ray has flashed, but injuries have limited him so far in his career, resulting in just 86 total pressures over his first three seasons. They used a top-five pick on NC State edge defender Bradley Chubb, who produced 58 total pressures in his final college season, while Barrett has flashed throughout his career and racked up 43 total pressures from 324 pass-rushing snaps in 2017. Should just one of those three step up opposite Miller, or if they can do it by committee, the Broncos should once again cause serious problems for opposing offenses. Lawrence finally delivered at the level the Cowboys were hoping for in 2017, racking up 15 sacks, 12 hits and 52 hurries before being hit with the franchise tag this offseason. Provided he can live up to his 2017 performance, the Cowboys should be in good shape once again, but they would be in much better shape if their 2017 first-round pick Charlton can take a step forward. From 232 pass-rushing snaps last season, the former Michigan standout managed just 21 total pressures. Crawford impressed as a pass-rusher last season as well, producing 37 total hurries, but with Irving, who produced 30 total pressures on the interior in 2017, missing the first four games of the 2018 season, this is a unit which has the potential to be very good again, albeit with a couple of question marks. The Vikings locked up Hunter long term after an eight sack, four-hit, 49-hurry performance in 2017, but Griffen remains the top pass-rushing threat on their defensive line. Griffen had his best season since entering the league, producing 13 sacks, 12 hits and 41 hurries during the 2017 regular season and playoffs, helping the Vikings all the way to the NFC Championship Game. The bonus for Minnesota is that linebacker Anthony Barr is an impressive blitzer, and ranked third among all off-ball linebackers with a PFF pass-rush grade of 74.9 last year. On the interior, the uber-talented Richardson arrives in Minnesota after spending 2017 in Seattle, and after producing 23 sacks, 42 hits and 153 hurries so far in his career. Don’t be shocked when the Bengals have one of the best pass-rush units in the NFL, because with a blend on youth and experience, they have the talent to give opposing offensive coordinators fits this upcoming season. On the defensive interior, Atkins was a terror in 2017, racking up 10 sacks, 10 hits and 50 hurries. On the edge, Dunlap provided a solid complement, with eight sacks, 14 hits and 50 hurries, along with seven batted passes. The wild card in 2017 was Lawson, as the rookie added 59 total pressures in a limited role. With a bigger role expected in 2018, he could be the player to push the Bengals into the top-five in terms of pass-rush production. The Saints made the playoffs in 2017 and looked like a serious threat to go all the way before coming undone in final seconds against the Minnesota Vikings, but with a potentially improved pass-rush in 2018, they should be right back in the hunt again this year. Jordan is obviously the key player here, racking up 14 sacks, 14 hits, 47 hurries and 10 batted passes in the regular season. Complementing him last season was Rankins, who quietly had a solid season as a pass-rusher with 44 total pressures on the defensive interior, and Okafor, who added 30 total pressures from 304 pass-rushing snaps off the edge. The key addition is first-round draft pick Marcus Davenport, after the former UTSA product delivered nine sacks, six hits and 37 hurries in his final season in college. Orakpo and Morgan are solid off the edge, combining for 18 sacks, 13 hits and 79 hurries in 2017, but the key to the Titans pass-rush is Casey on the interior defensive line. Casey impressed once again in 2017, producing seven sacks, 15 hits and 32 hurries and he has now delivered at least 50 total pressures in each of the past five seasons, and shows no signs of slowing down after the highest graded season (89.7) of his career in 2017. The potential wild card for the Titans is Landry. The former Boston College Eagle fell to the second round, after a disappointing 2017 season, but was dominant in 2016, racking up 18 sacks, seven hits and 44 hurries. If he can recapture that form, he will prove to be a steal for the Titans. 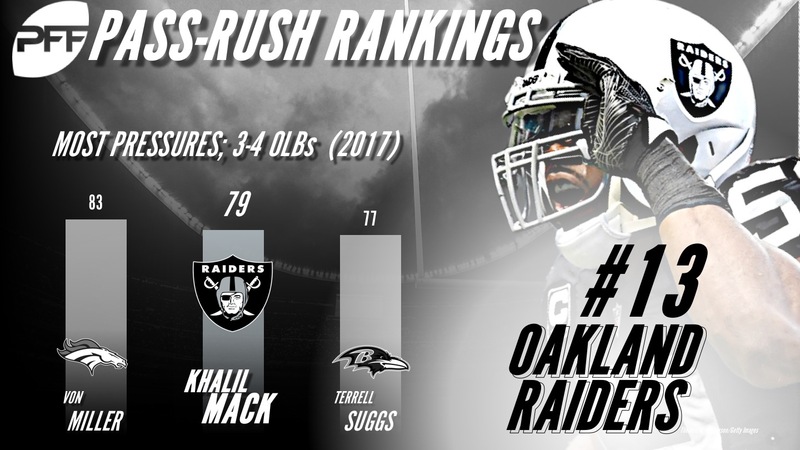 2017 was technically a down year for Mack, and he still was a nightmare for opposing offenses, with 11 sacks, 13 hits and 55 hurries off the edge. The fact that his career so far suggests that he should be even better than that again this year should send shivers down the spines of quarterbacks around the league. The big question for the Raiders is who else can deliver pressure on a consistent basis to support him, with Mack being responsible for 31.7 percent of their total pressures last season. Hurst is someone we were very high on in the pre-draft process. Obviously the question with him is his health, but he was dominant as a pass-rusher in 2017, producing eight sacks, 15 hits and 26 hurries. Another candidate is rookie Key, who could be a steal if he gets back to his early college form much like the aforementioned Landry. Key produced 12 sacks, 13 hits and 29 hurries in 2016 at LSU, but took some time off and struggled to make the same impact in 2017, producing just 28 total pressures. Four of the Steelers last eight first-round draft picks have been players either on the interior defensive line or edge defenders, so you would expect them to be even higher than this. Jones didn’t work out however, and Dupree has so far produced just 22 knockdowns through three seasons. Where the Steelers have found success though is on the interior, as Heyward has developed to one of the best in the business, with 62 total pressures in 2017, and former second-round draft pick Tuitt has formed a solid complement with 40 total pressures of his own last year. Where the Steelers hope to have found success off the edge is with last year’s first-round draft pick in Watt. He made some noise with two sacks in the season opener, and while his PFF grade didn’t quite live up to that, he still finished his rookie season with eight sacks, eight hits and 26 hurries. No defensive line in the NFL has undergone an overhaul quite like the Buccaneers this offseason, and we’re excited to see the results on the field. Incoming are edge defenders in Pierre-Paul, who has produced at least 50 total pressures in three of the past four seasons, and Curry, who racked up 47 pressures in the 2017 regular season. They also added Vea to pair with McCoy, who will hopefully reap the benefits of more help up front. The former Oklahoma Sooner produced six sacks, 15 hits and 26 hurries last season, and remains the Buccaneers top pass-rush threat from the interior. They key for the Falcons in 2017 will be how two former first-round draft picks perform in 2018. After being drafted with the eighth overall selection of the 2015 draft out of Clemson, Beasley racked up 16 sacks in his second season in the league. His PFF grade didn’t match that though, with a lot of his sacks coming as a result of unblocked pressure and in clean-up duty. Fast forward a year and Beasley managed to produce just seven sacks and 27 hurries. 2017 first-round draft pick McKinley did impress, particularly in the first half of the season, and finished his rookie campaign with eight sacks, four hits and 27 hurries including the playoffs. On the interior, while Jarrett is a better run defender, he still added 39 total hurries as a pass-rusher last season. The headline numbers for Matthews (10 sacks) look really good, but when you consider that he produced 29 total hurries and ranked just 23rd among the 46 3-4 outside linebackers with at least 130 pass-rushing snaps in terms of pass-rushing productivity (9.3), his full performance didn’t quite live up to that. Where the Packers do impress though is on the defensive interior where Clark and Daniels combined for 11 sacks, 11 hurries and 42 pressures. The key thing to remember there is that Clark is just 23 years old and heading into his third season in the league, so don’t be shocked to see a big step forward this season. The other potential improvement comes in the form of Wilkerson. He hasn’t lived up to his physical stature recently, but if he can get back to his pre-2016 form in Green Bay, the Packers would have another impressive pass-rusher along that defensive front. What the Seahawks lost this offseason is the biggest concern for them heading into 2018. Michael Bennett produced 70 total pressures in his final season but is now a member of the Eagles, while Sheldon Richardson’s one-year rental saw the former New York Jet rack up 36 total pressures. Clark will likely be the team’s top pass-rusher and has so far produced 26 sacks, 19 hits and 103 hurries in his three-year career. The other player to keep an eye on is Jordan. The third-overall selection in the 2013 NFL Draft, Jordan landed in Seattle after his release last season, and produced four sacks, three hits and five hurries from just 60 pass-rushing attempts. If he keeps up that pace, and say he rushes the passer a total of 240 snaps in 2018, he could be on pace for a 16-sack, 12-hit, 20-hurry campaign this season. The talent is there in San Francisco, but the big question is how they get them all on the field together, and make them fit. Buckner, the seventh overall selection in the 2016 draft out of Oregon is the player who everything should run through. His career progressed exactly as the 49ers would have been hoping for in 2017, and his 52 total pressures helped him to the third highest pass-rush grade (89.6) of any interior defensive lineman in the league last year. 2015 first-round draft pick Armstead has been solid, but 77 total pressures through three seasons is a little short of what you would expect from the 17th overall selection in the draft. Thomas was the third overall selection in the 2017 NFL Draft, but managed just 30 total pressures off the edge in his first season in the league. He was more on an interior player at Stanford, and was a much more successful pass-rusher in his final season in college, so how he progresses, and how he fits with the 49ers defense in 2018 will be interesting to watch. The Cardinals have one of the premier edge defenders in the NFL in Jones, but also hold big questions outside of him. Jones has been as advertised since they acquired him from the New England Patriots, producing 17 sacks, 18 hits and 41 hurries in 2017. He needs help though, and with Golden coming off an injury in 2017, that might be hard to come by. Golden has been productive with 21 sacks, 24 hits and 81 hurries, as most of those came in his first two seasons in the league, but has found a lot of his pressure coming unblocked, from stunts and in pursuit. When you combine that with coming off an injury, expectations should be tempered heading into 2018. Like the Cardinals, the Colts have a top pass-rusher in Sheard, but not a lot outside of that. Sheard racked up five sacks, eight hits and 54 hurries in 2017, making up 28 percent of the Colts total pressures last season. Two rookies who could contribute early for the Colts are former Rutgers edge Kemoko Turay, who produced 34 total pressures in his final season in college, and former Ohio State standout Tyquan Lewis, who had 38 total pressures in his final season as a Buckeye. The Colts need those two second-round draft picks to hit the ground running. Peppers produced 13 sacks in 2017, but just 31 total pressures. If our analytics department have taught me one thing, it’s that sacks don’t predict future sacks, and that pressures are a much bigger indicator of future sacks. With that in mind, don’t be surprised to see Peppers sack total dip significantly in 2018. Carolina’s top pass-rushers heading into the 2018 season are Addison off the edge, who has produced more than 50 total pressures in each of the past two seasons and Short on the interior, as he has been responsible for at least 49 total pressures in each of the past three seasons. Wake is still producing despite his advancing years, but the Dolphins will need more than just him if they want to make an impact on opposing offenses in 2018. Wake has produced double-digit sacks in five of the past six seasons, and the one season he didn’t was in 2015 when he missed a significant amount of time. This big loss up front is Suh, and while Phillips registered 25 total pressures, losing someone as disruptive as Suh is tough to get over. 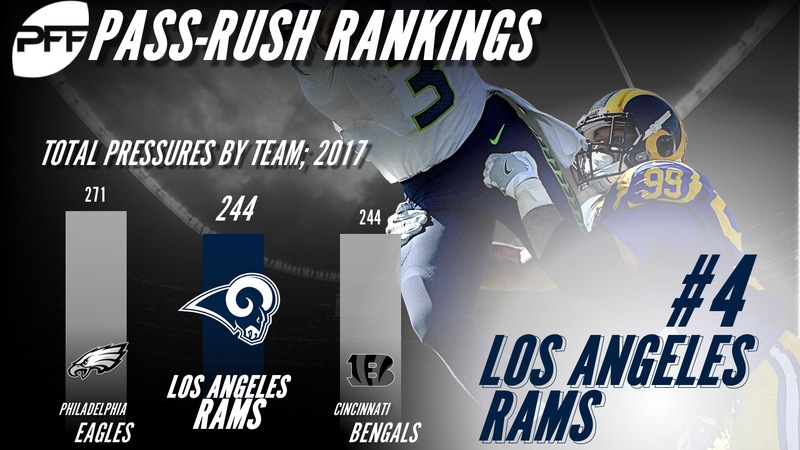 Quinn joins the fold, but we are now four full seasons removed from his big year for the Rams, so expectations should be low for 2018. Second-year pass-rusher Harris flashed as a rookie, as the former Missouri defender finished the year with two sacks, nine hits and 23 hurries. Ideally he can take a step forward and add even more to the Dolphins pass-rush in 2018. There is the potential for the Lions pass-rush to be much better than this, but there are also a lot of question marks. Ansah had 11 sacks a season ago, but just 38 total pressures, and that has been a theme in his career so far. Zettel was solid last year as the former sixth-round draft pick brought in 43 total pressures, while Hyder had 51 in 2016 before missing the 2017 season through injury. That’s three big question marks though. Can Ansah deliver consistently, can Zettel continue to improve and can Hyder return from his injury back at his 2016 level? Such is the theme for a lot of teams down at this end of our rankings, but the Ravens have players who could make an impact in 2018, just a lot of questions. Suggs continues to make a big impact despite the fact that he’ll be 36 during the season, and had 12 sacks, eight hits and 57 hurries a year ago. But who steps up opposite him, and who helps complement him if he needs a breather? Judon had nine sacks a season ago, but just 35 total pressures (louder for the people in the back, sacks don’t predict future sacks, pressures predict future sacks). Smith has produced just 12 sacks, 17 hits and 54 hurries through three seasons, while 2017 rookies Bowser and Tim Williams combined for three sacks, three hits and 10 hurries. The Chiefs two key players for their pass-rush heading into the 2018 season are at different stages of their careers. Houston will turn 30 in January, but is still producing, and racked up 11 sacks, 11 hits and 37 hurries last season, including the playoffs. Jones is heading into just his third season in the league, has just turned 23 years old and has already delivered two seasons of 38 or more total pressures while continuing to grow. Those two combined for just short of 39 percent of the Chiefs total pressures last year, and with Ford potentially starting opposite Houston, after registering just 20 sacks, 24 hits and 73 hurries over his four-year career to date, it’s fair to question if it will be left up to Houston and Jones in 2018, again. If Patriots fans are looking for a reason for optimism, it’s in their edge defender Flowers, who had 60 total pressures from 466 pass-rushing snaps in the regular season of his third year in the league. He has improved every season of his career, so there is no reason to not expect another improvement in 2018. They added Clayborn, who had a career year for the Atlanta Falcons last year, but it’s worth noting that six of his 10 sacks on the year came in a 12-pressure performance against Chaz Green and the Dallas Cowboys in Week 10. Much is expected of the 2017 first overall draft pick Garrett, and after an impressive rookie season as a pass-rusher, he will need to carry the Browns pass-rush hopes as far as he can in Year 2. Opposite him is likely to be third-year man Ogbah, who has produced 10 sacks, 13 hits and 44 hurries through two seasons, but at this point it hasn’t come in more than flashes. On the interior, the top candidates to even make a small impact as pass-rushers are Ogunjobi and Brantley, but they combined for just two sacks, three hits and 13 hurries last year. Vernon hasn’t hit the heights of his 2015 season, but has still been a solid pass-rusher in each of the past two seasons in New York. Last year, he registered nine sacks, five hits and 24 hurries 378 pass-rushing snaps. After Jason Pierre-Paul’s departure to Tampa Bay this offseason, their new addition in Martin could start opposite Vernon, but he has produced just 35 total pressures in his four-year career so far. Harrison and Tomlinson are stud run defenders, and while Harrison chipped in with 18 total pressure in 2017, neither should be expected to offer much as pass-rushers in 2018. Right now, expectations for what the Bears can expect off the edge pass-rush wise should be very low. Injuries have slowed Floyd’s development after he was drafted with the ninth overall pick in the 2016 NFL Draft, leading to just 72 total pressures through three seasons. Starting opposite him will likely be Acho, with Lynch in on nickel pass-rushing packages. Lynch has averaged four sacks, and just over six hits and 21 hurries per season in his four-year career. The Bears top pass-rusher right now is Hicks on the defensive interior, and after producing 49 total pressures in 2017, he will likely need to be their top pass-rusher again in 2018. After spending the 19th overall pick in the 2016 NFL Draft on Lawson, the Bills have seen just 673 snaps, and 30 total pressures out of the former Clemson star. That’s not good enough, but it is probable that he significant action in 2018. The Bills success off the edge likely comes down to Hughes, who registered just 45 total pressures last season. On the interior Williams anchors the core, who had 34 total pressures, and new addition Lotulelei, who has never registered more than 24 total pressures in a single season in his five-year career. Williams is a better run defender, but a more than adequate pass-rusher, who racked up 46 total pressure last season. He’ll likely need to make an even bigger impact in 2018 if the Jets are to worry opposing offensive coordinators, because the team is seriously lacking off the edge. Jenkins and Mauldin are the likely starters on the edge, with Jenkins registering 30 total pressures last year, and Mauldin producing nine sacks, 18 hits and 25 hurries between 2015 and 2016 before missing last year through injury.